Bring the water to a boil, then turn down to a low simmer and cook until the beans are tender. 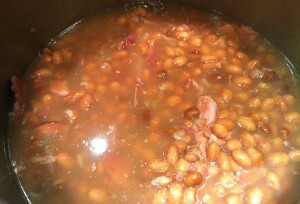 Here is what my flambo beans and ham looked like after their simmer time, once the main bone was removed to be worked on. Stir until all is heated and mixed in. Eat. 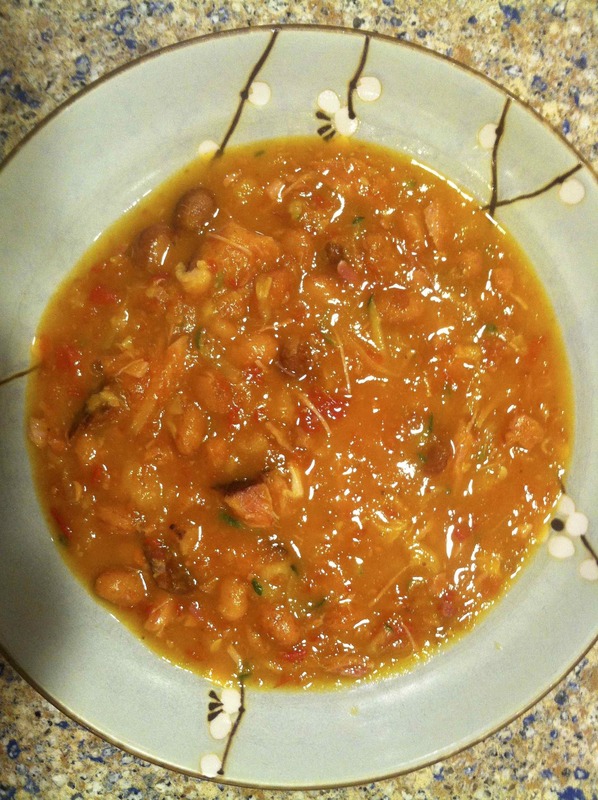 The flambo beans stood out to me as having a nice texture and flavor. I don’t normally notice the beans in things. Beans usually just seem like filler and sometimes color. Maybe I noticed the flambo beans more because they are larger than the average bean I use. They were still a mild flavor, but they added something of their own to the soup. Flambo Dry Bean Ham Bone Pumpkin Soup ready to eat! The pumpkin was also from the garden, freshly roasted and peeled. Yep, I peeled hot pumpkins. More about that on a later date; but I had enough pumpkin left over to make some chocolate chip pumpkin spice cookies based on my mom’s variation of the 1963 Betty Crocker Cooky Book recipe. The nice thing about both of these recipes is that pumpkin is not overpowering. I’m not thinking the whole time, oh, this is pumpkin soup or pumpkin cookies. I’m just thinking that eating them is satisfying in multiple ways. Healthy, filling, leaves me feeling good. I have had some trouble with my appetite lately. I’m thinking it is hormonal, so it is a relief to find some things that actually sound good and end up tasting good. And since I have a lot of pumpkins in the basement pantry, I can make more. I could even give a pumpkin to Rich!